The internet is increasingly becoming a tool for political activism and protest. 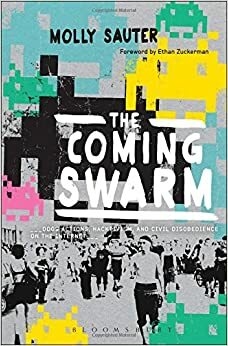 The Coming Swarm is one of the first publications which profoundly examines the dynamics of civil disobedience and specifically Distributed Denial of Service (DDoS) actions online. Molly Sauter has provided a solid historical analysis of the evolution, theory and practice of these activist/hacker/hacktivist tools and paved the way for future research on online tactics of disruption. Although the book has a US-centric emphasis, Leonie Maria Tanczer encourages specifically scholars of internet-specific social movement and collective action research to have a close look at this investigation. DDoS actions are certainly more political than the public discourse portrays them to be. The Coming Swarm – DDOS Actions, Hacktivism and Civil Disobedience on the Internet. Molly Sauter. Bloomsbury. October 2014. The Coming Swarm is the first book publication from Molly Sauter, aPhD student at McGill and alumni of the Berkman Center for Internet & Society and the MIT Center for Civic Media. Whilst Distributed Denial of Service DDoS actions have become criminalised and equated with the hacktivist collective Anonymous, Sauter reviews the diversity of incidents where these tactics have been deployed. She masterfully targets the common arguments brought forward to delegitimise and depoliticise these actions and gives a theoretically well-supported claim that society needs to acknowledge that the nonexistence of an actual ‘public’ space and the privatised nature of the internet has fostered the development of such collective and disruptive forms of civil disobedience online. The book is broken into seven chapters, excluding an introduction to the topic and a conclusion highlighting the future of DDoS actions. The publication moves from the theoretical analysis of the concept of civil disobedience and as a category of direct action, to the sociological and anthropological study of the media portrayal and identity construction of activists, up to the more technical and legal examination of the tools being used. It, thus, provides a comprehensive and ample study of this phenomenon, explaining the book’s multiple endorsements from distinguished internet researchers and activists like Jonathan Zittrain, Cory Doctorow, or Sauter’s current supervisor, Gabriella Coleman. DDoS actions have only been around for the last twenty years. The Coming Swarm therefore situates itself within this time-frame and refers to exemplifying events such as the electrohippies at the end of the 1990s or the anti-deportation protest against Lufthansa at the beginning of the 2000s. These illustrations are spread across all chapters and help the reader to understand the author’s arguments by applying them to real-life scenarios. It is incredibly refreshing to hear about DDoS operations beyond the scope of Anonymous, even though the collective takes up a lot of space within the analysis. Indeed, Chapter 2, which categorises several incidents as forms of direct actions, makes use of these references, emphasising the symbolic value DDoS tactics actually aim to perform. Furthermore, Chapter 5 touches upon the actual necessity for anonymity in a society which criminalises and demonises forms of protest online. Hence, online civil disobedient tactics should rather serve as indicators for society that “the normal channels of participation have failed” (p. 93). Moreover, Chapter 7 outlines the responses of corporate and state entities against DDoS actions and puts them in place with the more general regulation and governance of the internet. For scholars unfamiliar with the topic it is probably the most insightful chapter. It reveals the hypocrisy of current debates as we are faced with governments who apply DDoS actions themselves for tactics of harassment, censorship, or cyberwar. Additionally, it displays how such acts are disproportionately persecuted compared to both equivalent crimes and other forms of activism. Subsequently, the author picks up on the difficulty of receiving a fair sentence “[w]hen the relevant ‘judge’ is also the target of the disruptive protest” (p. 140) and the conviction is not based on “what they actually did, but based on how little the arbiters of justice know” (p. 143). One of the minor weaknesses of the book is its relatively US-centric emphasis. It would have been valuable to talk about the deployment, perception, and legislation of DDoS tools beyond a purely Western focus. Although it is not certain who and how many are standing behind an activity, and credit is given to incidents in Germany, Israel and in support of Mexico, the majority of the discussed issues seem to focus predominantly on North America. Nonetheless, this does not diminish the importance of Sauter’s work, but leaves room for further research. Ultimately the scope of the publication is ambitious and the analysis trenchant. The book covers various facets of online civil disobedient actions and provides substantial arguments in defence of the legitimate usage of these tactics. This makes The Coming Swarm a valuable source for researchers, activists and even policymakers, and it should find specifically a home on the shelves of social movement and collective action scholars. Leonie Maria Tanczer is PhD candidate at the School of Politics, International Studies and Philosophy at Queen’s University Belfast and former Fellow at the Alexander von Humboldt Institute for Internet and Society. Her PhD is inter-disciplinary and investigates the emerging cyber security governance strategies in Europe, with a particular focus on hacking and hacktivism. Her publications cover gender-specific examinations of politically motivated hacking as well as interviews with members of the Electronic Disturbance Theatre. Some of her further research interests include Gender Studies, online collective action, and Science and Technology Studies. You can follow her on Twitter @leotanczt.